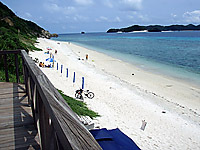 Nishibama Beach is a natural beach which is on the east of Aka Island. Its emerald green colored sed is very suitable for swimming. You can see some isolated islands from this beach. There is a diving spot near this beach, so you can enjoy marine sports like snorkeling. A great straight beach on the north shore of the island, overlooks a beach of white coral sand as well as a beautiful gradation of a clear blue sea known as Kerama Blue. This is a great scuba diving/skin diving point where you can swim with beautiful tropical fishes which live in coral reefs. It's a one of especially beautiful beachs in the Kerama Islands. A shower stall and lavatory are available.